Part one in a five-part series on small business recruitment. As the economy improves, more employees who held onto their jobs through the tough recession years are gaining confidence to leave jobs they don’t love and look for new opportunities. With more people again seeking to spread their wings, businesses of all sizes are also increasingly looking to recruit the best talent, both among these job seekers and the many workers who aren’t even looking. For many small businesses, hiring is already a bit of an unknown. 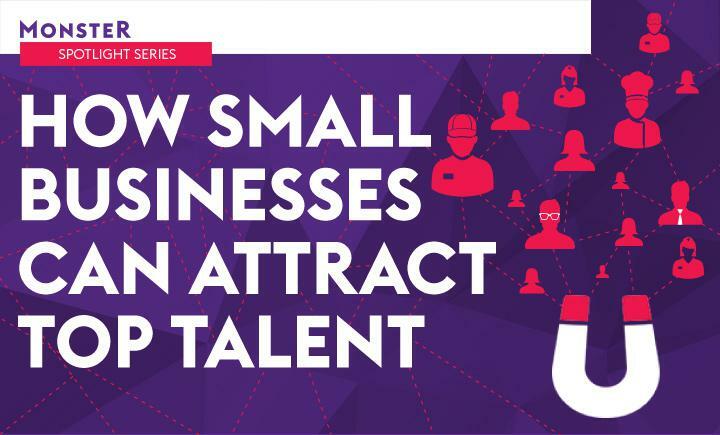 As the competition for talent grows, how does a small business attempt to tackle the challenge of recruiting? Small businesses provide two out of every three American jobs, according to the U.S. Small Business Administration, and fortunately, there are many employees who want to work at one. In fact, 46 percent of people who responded to a recent Monster survey indicated they would actually prefer to work at a business with between six and 100 employees. And yet, it’s the small business that might face the biggest disadvantage when hiring in a competitive environment. After all, a small, proprietor-managed company typically doesn’t have HR people to turn to when it needs to find qualified candidates and ensure the one it hires will be a good fit. When it comes to hiring for small businesses, establishing your brand through a strong company culture is key. Whether you’re writing a job ad, describing your company to others or even simply setting up your website, communicating that culture will help potential candidates decide whether they’re a good fit for your organization. But first, as owner or CEO of the business, it’s important to foster the sort of culture you want, says Paul Downs, founder of Paul Downs Cabinetmakers in Bridgeport, Pennsylvania, and a small-business blogger for The New York Times. “You can create a culture by the standards you set for your own behavior and those you enforce with others. If you’re a yeller and screamer and tolerate yelling and screaming, that’s what it’ll look like,” Downs says of small-business culture. “If you use ‘fast-paced, hard-hitting, take-no-prisoner’ code words in the ad, then I would expect the yelling and screaming” type of applicant. As you put together a recruiting strategy, talking about why your organization does what it does is just as important as the job description. People want to feel like they’re doing meaningful work, so you need to be sure to communicate what that will look like at your company. It's your job to find the right people — it's our job to make it easier. Visit Monster's hiring site to learn more. Weintraub says team members hold wedding rehearsal dinners, baby showers and even Thanksgiving celebrations at the aimClear office. “The environment is totally nurturing and seriously professional."